bolt on a 1953 Special 263 ci engine ? Sure will. I have read the motor mount has to be modified to use the exhaust. The drivers side motor mount "tower" would need to be lowered to clear front exhaust manifold. Forgot to add that the way to gauge height of mount tower, is to turn the engine plate upside down and when bolted back on gives the height the tower needs to be at. Bolting the setup to a 263" engine, however, is not an issue, except if using a 1948 up chassis which changed the front motor mounts from the front timing cover plate to the four bolt mounts on both sides of engine. The drivers side motor mount "tower" would need to be lowered to clear front exhaust manifold. Bolting the setup to a 263" engine, however, is not an issue, except if using a 1948 up chassis which changed the front motor mounts from the front timing cover plate to the four bolt mounts on both sides of engine. I'm looking at a 53 Special hdtp with a stick shift. would make the car jump ! 55 Century model 68 clone with 3 deuces . My current effort is in the mode of making less unhappy. Its seemingly more realistic! 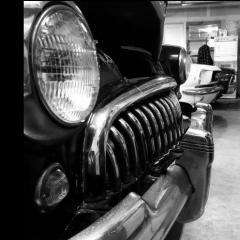 It was always my father's trick that when he bought an old car, he would give it to my mother. She eventually owned about a half-dozen old cars she could neither start nor drive, but how many of her friends were able to claim their husbands bought them a car for their birthday every few years? Here is a pic of a 49 I just picked up. The motor mount was definitely lowered i just can’t tell how they dropped on the engine. I can get better pics in a couple weeks when I find time to pull the front clip and engine. The "L" shaped motor mounts bolt to the side of the engine with 4 symmetrically,(evenly)spaced bolts, so the motor mount can be flipped downside up, bolted right back on, which lowers it enuff for exhaust to clear it. When you look at the pass side closely, then the driver side, it will make this confusing text understandable. He said hopefully! Just bolted through the top holes of the bracket to the bottom holes on the engine? No. The mount bolted to the engine is removed and turned 180 degrees. This changes the part that bolts to the frame mount to end up lower by the height of the stamped steel mount. The frame "tower" is reduced that amount by cutting and flt top reinstalled for the stamped steel mount to bolt to. I guess Ill photo the stamped steel mount to illustrate. Craig's picture shows it upright. I know what you are talking about. His looks like someone found another way. Or am I seeing things? It looks as though a severe bend was done on the front header pipe, which I think looks fabbed, not stock. Hard to guess from photos. I was stating what I've heard and seen done with drivers side mount. No personal mods of that exact kind. Cool factor high, if need be, "cut the sucker!" Hee hee! I'm in! I think your correct. It’s still on the trailer and I’m not able to see how it’s mounted on the block. I’m going to pull the front clip then the engine in a couple weeks. I’ll try to get some better pics then. Hi, I'm new to the forum and have a question about this topic. 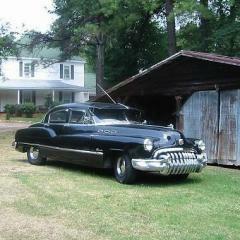 I have a 1948 Buick Roadmaster with a 320 cubic engine. 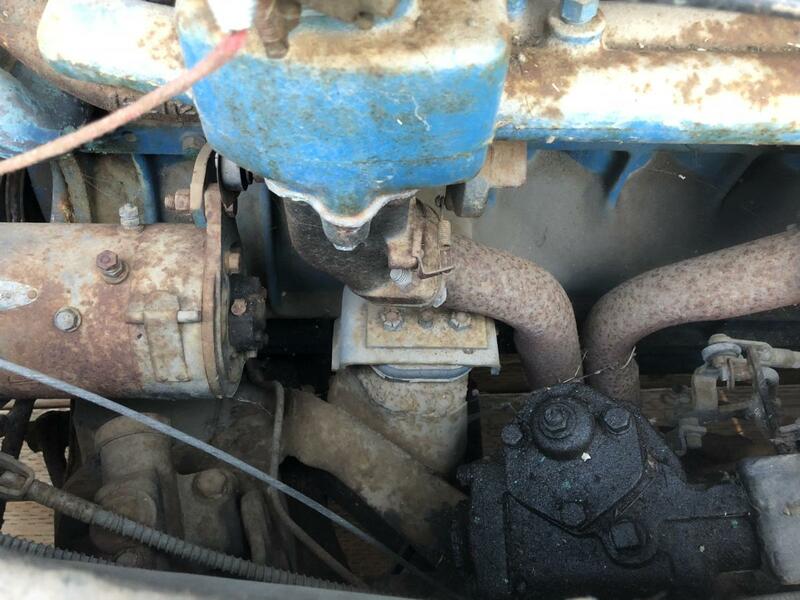 I would like to install a 41 dual carb setup and from what I gather from reading is that I would have to rotate the engine bracket 180 degrees and then modify the tower mount bracket. My question is how do I modify the tower to fit the rotated engine mount? Also, will the rotated engine mount have sufficient strength as the stresses on it are opposite from what it was designed for? Cut the mount tower off as determined by the rotated engine mount. Cap the tower with flat stock welded on after tracing the top of the tower for correct shape(dont forget to allow room for rubber mount when tower height is determined. I do, however like the reconfigured headpipe I saw in the previous post. Might be better/simpler option! Oh yeah, forgot to ask if your thinking stock '41or Edmonds custom aluminum 2X2 for intake? Thanks for the prompt response. I already have a complete stock 41 setup. The manifolds need to be blasted and coated and the carbs need to be rebuilt which will not be cheap. What is the 2x2 ? Sorry Guys....,I could'nt deny myself that little Joke..😉..